This book will stand as a testament to the past glory of Wal-Mart’s hegemonic retail power. While Wal-mart hasn’t been relegated to the dust bin of retail history, the spectre of Sam Walton’s mega business still haunts sleepy towns and recessed villages with the looming threat of roll-back prices. But even if the headlines heralding the decline of Wal-Mart are to be trusted, the impact that Wal-Mart has had on the retail scene have been many, these impacts are the Wal-Mart effect. This book peels back the banal facade of Bentonville and takes a dime tour through some of the wrangling that happens at Walmart, from the ever bustling action ally to the windowless offices at Home Office( head quarters) in Bentonville. After the first edition was published, Fishman had the pleasure of visiting Home Office, and he wrote about it in the edition I read. He noted the feeling was similar to entering the back room of a supermarket – the transition from store front, the functional space. Home Office was austere, un-decorated, banal, with a notable lack of windows. This observation illustrates the corporate culture that is present from the top at Home Office, all the way down to your local Walmart. 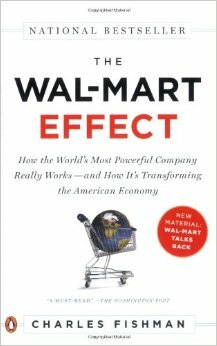 Walmart’s values are unpretentious, frugal, modesty, drive, energy and determination to drive a hard bargain (pg.225). While Fishman’s book is less than 300 pages, Fishman does an excellent job at detailing the large corporate leviathan that Wal-Mart has become. The Wal-Mart effect has left a legacy of cheapness, a frugality that is practiced by Walmart and the savings are passed onto consumers. Fishman details the historical ascent of Walmart, from the humble beginnings, how Sam Walton worked perilously, how Walmart practiced frugality and how finally Walmart grew into the giant corporate creature we all know today. The best illustration of this growth was store #2, it grew from a humble operation in a strip mall, to a supercentre that is twenty times the size of it’s original operation. But the relatively new company grew up quickly, in it’s tracts it left an array of damage. Walmart depresses wages, Walmart has destroyed free markets by exercising immense power on it’s suppliers. The Walmart effect is more than just bullying JL Nelson, a small sprinkler company (by essentially ensuring that future production takes place in China), but Walmart even holds power over giants such as P&G. The litany of misdeeds that Walmart has done is well detailed in this book, while at the same time giving charitable treatment by offering up positive things Walmart has done. The evaluation of Walmart is done by talking to locals, those who have their businesses go through immense growth to bust, unable to satisfy the unsasitable demands of the ever demanding Walmart. Sam Walton’s store has transformed a generation of consumers to demand cheap. Walmart has revolutionized how retail is done now a days. Walmart’s ascent to be one of the largest non-oil companies in history is evidence of this. But Fishman’s work which is now almost 10 years old, sometimes feels dated. I could only wonder how Fishman would write about Walmart in 2015, especially after the news of Walmart losing 10 percent of it’s value in stocks – the largest single loss in Walmart since it went public-, the Walmart discussed in the Wal-Mart Effect sounds like a Walmart that doesn’t exist anymore. But I still think Fishman’s contribution is important and even if grandiose claims about Walmart being one of the most valuable companies in the world are no longer true, Walmart has been edged out by the likes of Amazon (market cap: $3115.5 B to Walmart’s $191.1 B) and a litany of tech companies that illustrate that “retail isn’t as cool as it used to be”. In the same vein, I still sometimes don’t feel that the Walmart sketched out in the chapters of the Wal-Mart Effect reflect the Walmart I interact with. While I don’t hold this against Fishman, I deal with Walmart Canada, not Walmart proper, I still have a hard time believing that Walmart Canada does really care about it’s central mission that Sam Walton set out to do: offer the cheapest price. But my experience is anecdotal, thus, I don’t actually hold it against the book when scoring it, but it is something to keep in mind if your passport is Canadian and you want more insight into your Walmart. Despite it’s at time dated facts and events, this book still delivers an interesting insight into the modern main stream retail scene. In the end Fishman suggests that good, bad, or indifferent, we could all benefit from more information that hasn’t been forthcoming from Walmart, from about every dimension, Walmart has put up an iron curtain of secrecy. The last point Fishman leaves us with, Walmart is human, Home Office wasn’t filled with cyborgs, but layers of people making decisions. Can Walmart better itself as a corporate citizen? Can Walmart repair some damage that the public has levied on Walmart? To use an overused cliche, only time will tell.